Awesome job done on time and to budget. Not only did they turn up on time – they actually turned up early !! Our office in Oxley is now lighter and brighter than ever before. Thanks guys !! Make life easier for you and your clients by working with an electrical team that understands the unique needs of your Body Corporates and who understand the process of how to work best with all involved. 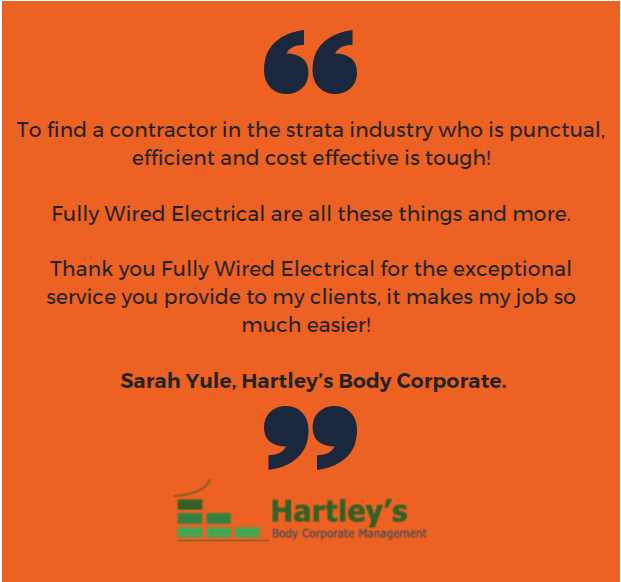 With over 10 years’ industry experience providing exceptional body corporate electrical services, Fully Wired Electrical are the local Brisbane team you want to work with to get the job done right. We are here to lesson your workload by working directly with site contacts, automatically scheduling regular safety compliance and ensuring all work is completed within 5 Days or it’s FREE!! We’ll become your eyes and ears and proactively identify any electrical defects – giving the body corporate peace of mind. With Fully Wired, you’re in good hands! Fully Wired are your one stop shop. You send the work order, We’ll take care of it!! Need the emergency light tested, replaced or installed at your Body Corporate? What is the Emergency Light Testing Legislation and does it apply to me? Why is an Emergency Light Test important? What is included in an Emergency Light Test by Fully Wired? Don’t let any electrical issues within a Body Corporate Switchboard go undetected – regular Switchboard Inspections are the key to proactive identification and prevention of any potential dangers. What is the Switchboard Inspection Legislation and does it apply to me? Why is a Switchboard Inspection important? What is included in a Switchboard Inspection by Fully Wired? Safety switches are now a critical component of an electrical safety system and is a requirement for all new installations and additions to existing circuits. What is the Safety Switch Testing Legislation and does it apply to me? Why is a Safety Switch Test important? What is included in a Safety Switch Test by Fully Wired? It’s pretty clear why this is important. It’s not the fire that kills people but the smoke! The humble smoke alarm can only do its job if it’s operational. What is the Smoke Alarm Testing Legislation and does it apply to me? Why is a Smoke Alarm Test important? What is included in a Smoke Alarm Test by Fully Wired? Safety is paramount and we understand the importance of meeting electrical safety standards, particularly for Body Corporates. Trust us to take care of all your regular electrical safety compliance and maintenance for you. We will schedule and if required, seek approval before arriving on site to complete the required works. Extensive reporting and feedback is provided to all Body Corporate Managers as to any issues or safety concerns which may arise. What is electrical compliance scheduling? What services are included in electrical compliance? What are the benefits of having Fully Wired Electrical schedule and complete all electrical compliance? What are the steps to start regular scheduling of electrical compliance? So Why use Fully Wired?